Saul Karath was a Human male born on Corellia who served the Galactic Republic’s Navy as an admiral during the Mandalorian Wars. In 3,963 BBY, Karath was promoted to the rank of Rear Admiral after keeping the Mandalorian forces at bay for six weeks at the Jebble-Vanquo-Tarnith line. When the fugitive Jedi Padawan Zayne Carrick—who was fleeing from his Masters after being framed for the Padawan Massacre of Taris—attempted to warn Karath of Serroco’s destruction, Karath assumed that Carrick was a Mandalorian spy. Shortly after the Mandalorians razed Serroco’s surface, Karath participated in the Adasca Affair, which was Adascorp leader Arkoh Adasca’s failed auction of exogorth superweapons. Karath also played a role in the events of the Covenant Affair, in which the secret Jedi cabal known as the Covenant was destroyed. Later that year, the Jedi Knights Revan, Malak and their Jedi faction entered the war, and Karath became the Jedi’s subordinate. In 3,960 BBY, Revan and Malak led the Republic to victory against the Mandalorians in a final battle above the Sith world Malachor V.
After the battle, Karath was one of the few among the Republic forces that did not follow Revan and Malak into the Unknown Regions to search for the ancient Rakatan Star Forge space station. A year later, Revan returned to the Republic as the new Dark Lord of the Sith, with Malak as his apprentice, igniting the Jedi Civil War. In 3,958 BBY, Karath transferred his allegiance to Darth Revan’s Sith Empire, bringing his flagship Leviathan to Revan’s service. In order to test Karath’s loyalty, Malak ordered the Admiral to destroy the planet Telos IV. Karath killed millions of civilians on Telos, and earned the wrath of his former friend and protégé Carth Onasi, who served with Karath during the Mandalorian Wars. After Malak betrayed Revan during the Jedi and Republic’s attempt to capture them, Karath continued to serve the Sith forces under Malak’s command. In the war’s final year, Malak captured the ecumenopolis of Taris and ordered the Sith fleet to blockade so that the Sith forces could search for Jedi Knight Bastila Shan. Karath was eventually ordered by the Dark Lord to destroy the planet so as to prevent Shan’s escape, and Karath bombarded Taris. Shortly after Taris’ destruction, Malak and Karath were informed by the bounty hunter Calo Nord, who survived the Sith’s bombardment of Taris, of Shan’s escape from the planet. Nord also told them of Revan’s survival and involvement in Shan’s escape. Malak and Karath hired Nord to capture Shan, but Revan, now a partially retrained Jedi, killed Nord during his search for the Star Forge. After Revan located a fourth Rakatan Star Map—which was needed to find the Star Forge—and killed Malak’s Shadow Hand Darth Bandon, Karath captured Revan’s starship Ebon Hawk. Karath tortured Revan, Onasi, and Shan in an attempt to find out what their mission was. The two Jedi and Onasi eventually escaped the detention area and headed to the bridge in order to confront Karath and disable the tractor beam, so that the Ebon Hawk could escape the Leviathan. When Revan, Shan, and Onasi made it to the bridge, Karath offered to ask Malak to be merciful if the Jedi and Onasi surrendered. The two Jedi and Onasi refused, and Karath and his forces attacked them. After a heated firefight, Karath was grievously injured. Karath told Onasi about Revan’s true identity as the former Dark Lord, and mocked his former friend before he succumbed to his wounds. Saul Karath, a Human male, was born on the Core world Corellia to journeyman laborer Craddock Karath. The eldest of five children, Karath was forced into adopting a paternal role toward his siblings due to his father’s frequent absences and supported them by working double shifts at a weapons factory. In 3,996 BBY, when the Sith Lord Ulic Qel-Droma and Mandalorians under Mandalore the Indomitable attacked the shipyards at the world Foerost, Karath’s father died in the assault after the Republic officer Dace Golliard fled the battle. Karath left his job at the factory and volunteered his services to the Navy of the Galactic Republic against which Qel-Droma’s Sith Master, Exar Kun, was fighting. Karath was too young to serve the Navy officially and, because of his tough upbringing, the young Corellian did not possess the connections to enter the Naval Academy. Nevertheless, Karath won the attention of Fleet Captain Orley Vanicus, who allowed Karath to serve as a non-commissioned captain’s steward on his ship Reliance I. For every success Karath gained, a setback followed. However, due to the fact that he considered the Navy his family, the young man never lost faith in the institution. Eventually, Karath was promoted to the rank of captain and given his first command aboard the frigate Reciprocity. During this time, Karath was successful in defending convoys against pirates. At one point, when the Reciprocity was in an engagement with enemies, Karath recognized the Republic pilot Carth Onasi‘s skills. When Karath was promoted to the Inexpugnable-class tactical command ship Courageous, he invited Onasi to serve with him aboard the warship, bestowing the nickname “Fleet” on the pilot. In 3,964 BBY, at the onset of the Mandalorian Wars—the conflict between the Galactic Republic and the Mandalorian Neo-Crusaders—Karath helped organize the defense of the Outer Rim ecumenopolis Taris and its nearby systems against the Mandalorian armada. From his flagship Courageous, Karath managed to halt the Mandalorians’ progress at the system of Suurja through four large-scale battles, thus keeping the Jebble-Vanquo-Tarnith line, a boundary between the Republic and Neo-Crusader forces, intact. Not long after, Karath was sent to defend the trade post of Vanquo from the invading Mandalorian fleet. As he had predicted, the attack on Vanquo was only part of Mandalorian leader Mandalore the Ultimate’s plan for invading the Republic; while Karath’s forces were busy at Vanquo, the Mandalorians assaulted the remainder of the Republic fleet at Taris. Karath saw this development as a positive, as he was certain that when an important world like Taris was threatened, the Republic Senate would put more troops into the conflict. During the Battle of Vanquo, Karath was informed by Lieutenant Dallan Morvis that a junk freighter was fleeing the battle. The ship, called the Last Resort, belonged to the elderly Arkanian scientist Gorman Vandrayk, who was assisting the fugitive Jedi Padawan Zayne Carrick. Carrick was on the run from his Jedi Masters, having been accused of carrying out the Padawan Massacre of Taris. The Last Resort was speeding away from Vanquo and entering hyperspace into Mandalorian territories. When Morvis informed Karath that it was Carrick’s ship, the captain immediately suspected that Carrick was a Mandalorian spy. Karath vowed to deal with Carrick personally, provided that he survived the battle. In 3,963 BBY, Karath was promoted to the rank of Rear Admiral. After he was transferred to the planet Serroco, Karath toured the local Republic camp on Serroco’s surface. Zayne Carrick—who was working under the alias Shad Camper at the supply carrier and restaurant Little Bivoli—accidentally spilled a tray of food on Karath, who ignored him. Carrick was immediately reprimanded by Dallan Morvis.After having a vision through the Force of the Mandalorians destroying Serroco’s surface, Carrick told his partner and the head of the Little Bivoli, Marn Hierogryph, that he needed to warn Admiral Karath. 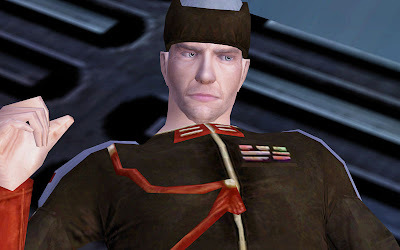 Carrick then sneaked on Lieutenant Carth Onasi‘s ship Deadweight; after he was discovered by Onasi, the Jedi convinced Onasi to take him to Karath. When Onasi brought Carrick to the Admiral on the bridge of Courageous, Karath congratulated the lieutenant, and proceeded to accuse Carrick of being a Mandalorian spy. Karath interrogated Carrick, who denied knowing Mandalore and the accusations of being a spy, and asked Karath to allow Onasi to try to get in contact with the Jedi Knight Alek, known to Carrick as “Squint”. Karath instructed Onasi to go the the command center, contact the Jedi Council, and see if they could locate “Squint”. At that point, the Mandalorian ships dropped out of hyperspace, and launched nuclear missiles towards the Republic fleet. Karath attempted to counter the attack, but instead of heading towards the fleet, the missiles continued towards Serroco’s surface. The missiles destroyed the Stereb cities, and inflicted heavy damage to the human settlements. As Carrick wept over the planet’s destruction on the Courageous’s bridge, Karath knew that it was time to rethink their strategies against the Mandalorians. Karath promised Carrick that he would hand him over to the Jedi, as the Admiral knew that what the Jedi would do to Carrick was far worse than anything he could ever do. Until then, Karath had the Padawan sealed in a cell. When Mandalorian shock troopers boarded the Courageous, Karath was forced to abandon ship with Lieutenant Onasi and Commander Morvis. Karath reluctantly agreed to take Carrick along with them as they fled to Onasi’s ship Deadweight. After escaping the Courageous, Karath filed a report with the Admiral of the Fleet concerning the disposition of his forces, which were under pursuit on the hyperspace lanes from Serroco to the banking world Telerath. Karath also hoped to make it to Myrkr or the Ryyk Nebula, where they could meet with the Tremendous fleet. In his report to the Admiral of the Fleet, Karath noted Onasi’s and Morvis’ performances during the battle. Shortly after escaping the Legacy’s destruction, Karath complimented Onasi on the quick escape from the Mandalorians. After Morvis managed to reach communications with Arkania Command, Karath told Carrick that while he could not turn the Padawan in to the custody of his former Jedi Master Lucien Draay, who ordered the Padawan Massacre, Karath would get another chance to do so. When the Deadweight was in transit to Arkania, Karath received a transmission from the Duro Eejee Vamm—a servant of the medical corporation Adascorp, which was headed by Lord Arkoh Adasca—requesting Karath’s presence at a meeting onboard Adasca’s flagship Arkanian Legacy. After being informed about the exogorths, space slugs which Adasca’s scientists modified to be superweapons, Karath ordered Onasi to redirect the ship to the Legacy. When they arrived, Karath told Onasi, Morvis, and Carrick how old spacefarers talked about the exogorths, and that he had originally thought the slugs were a myth. The four prepared to board the Legacy. Karath tells Mandalore the Ultimate to step away from Jedi Knight Alek. When Karath disembarked the Deadweight, Adasca greeted him, stating that he felt Karath was the perfect Republic representative for the meeting. Adasca asked Karath if he was able to negotiate on the Republic’s behalf, and Karath attempted to inquire as to what Adasca meant. As Carrick was disembarking the Deadweight with Onasi and Morvis, Jarael—the female Arkanian offshoot who helped Carrick elude the Jedi Masters on Taris—noticed Carrick and kissed him. Karath asked Adasca if his forces could find a detention area to imprison Carrick, and Adasca had Vamm move Carrick to the ship’s detention area. Later in the observation dome, Karath was listening to Adasca talk about the exogorths and how they could be operated as weapons capable of destroying entire star systems. After Adasca finished, the Jedi Knight Alek, who was representing the Jedi Knight Revan’s faction of Jedi at Adasca’s meeting, expressed his horror and disgust. Karath asked Adasca what exactly he wanted; when the Mandalorians led by Mandalore the Ultimate arrived at the meeting, Karath told Adasca that he had gone too far. 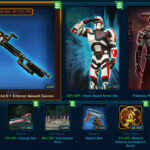 Adasca stated that his corporation was now a galactic player, and that they sought allies, not contracts. 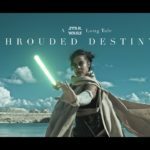 After Mandalore boarded the Legacy, Alek attacked Mandalore, but Mandalore hit the Jedi with a battle axe constructed from the wreckage of the Courageous, which knocked Alek down. Karath pointed his blaster at Mandalore and told him to back off, and Mandalore taunted Karath. 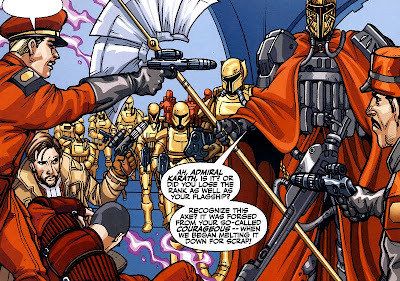 While Mandalore was having a conversation with Mandalorian Rohlan Dyre, Alek tried to convince Karath to arrest Adasca, but Karath refused, citing their outnumbered position. A short while later, Adasca commenced with a test of the exogorths, and Onasi became disgusted at what he witnessed. He asked for Karath’s permission to return to the Deadweight, which the Admiral granted. When Mandalore commented that he wanted to keep the exogorths out of Republic or Jedi control, Karath retorted that they were one and the same. Mandalore expressed his disbelief at that statement, and Karath asked Mandalore why he did not just take the exogorths. When Mandalore offered to make Adasca weaponsmith of all the Mandalorian clans, Adasca commented that the senate seat Karath had offered him seemed petty in comparison. Karath began to grow desperate, and asked Adasca if he wanted his own territory. Meanwhile, Zayne Carrick and his former Jedi Master Lucien Draay—who had been ordered by Haazen, a co-founder of the secret Jedi cabal known as the Covenant, to investigate Adasca —met up with Onasi and Dyre and worked together to put an end to Adasca’s scheme. Both Carrick, who was in the armor that Mandalore had given to Dyre earlier, and Onasi made it to the observation dome, and started a diversion. This caused Karath and Mandalore to attempt to control the two, but when Carrick ignited his lightsaber, Draay stormed the room and Alek prepared to attack. Mandalore immediately accused Adasca of treachery. Karath, along with Carrick, Draay, Onasi, Jarael, Dyre, and Morvis, participated in the ensuing battle. Karath was injured during the battle, and Morvis ordered Onasi to capture Carrick while he escorted the Admiral back to the Deadweight. However, Onasi let the Jedi escape, believing that Carrick was innocent of the charges levied against him. Karath, Onasi, and Morvis successfully escaped the Legacy’s observation dome as the exogorths under Gorman Vandrayk’s command devoured it, killing Adasca. After Karath, Morvis, and Onasi reached the galactic capital Coruscant, Karath filed his resignation to the Admiral of the Fleet due the loss of Battle Group Serroco and the Courageous. However, the Admiral of the Fleet refused to recognize Karath’s resignation, and met with Karath, Onasi, and Morvis. After this, the Admiral of the Fleet publicly commended Karath. While the Admiralty did not immediately assign a posting to Karath, the Admiral stated that he appreciated the public’s support, but that he wanted those in his position to have a chance to see their families, “in the name of those who did not make it home”. Karath also confirmed Arkoh Adasca’s death, although he declined to speak of the events that transpired. Sometime after the Battle of Omonoth, Karath was given command of the capital ship Swiftsure. He was then assigned by the Jedi Master and newly appointed Council member Lucien Draay to the planetary defense of Coruscant. 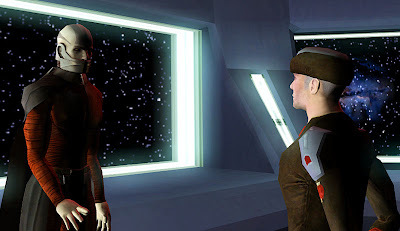 Not wanting Carrick to expose the Covenant to the Council, Draay told the Admiral that Carrick would be aboard the Moomo Williwaw—the starship of the Ithorian bounty hunters Dob and Del Moomo—and also warned Karath that the fugitive would attack the planet on behalf of the Mandalorians. Because of the Khil Jedi Master Xamar’s experience with the Republic Navy, the Covenanter was assigned to the Swiftsure by Draay to ensure that Karath did not take Carrick as a prisoner. When Xamar met with Karath, the Admiral assured the Jedi that nobody would get through without going through the defense. Karath ordered the initiation of the Vanjervalis Chain, a sensor package that not only predicted enemy movements and adjusted strategies, but linked multiple Republic cruisers under a single command. Xamar asked Karath how Carrick seemed when he met him, and Karath replied that the Padawan did not always make sense and that Carrick was absolutely sure he was right. Karath aboard the Swiftsure during Sith Acolyte Haazen’s insurrection against the Jedi Order. When the Moomo Williwaw approached Coruscant, Xamar expressed his concern that Carrick would be able to break through the blockade. Karath suggested that the Jedi get in a starfighter and join the other Republic fighters’ efforts, assuring the Khil that his forces would not accidentally shoot the Jedi. This startled Xamar, because of his vision that prophesied that he would be killed by the Republic fleet in friendly fire. After Xamar left the Swiftsure, the Moomo Williwaw crashed in the ship’s docking bay. Karath and his forces managed to get the bay doors open; when the Moomo brothers and Carrick’s companion Jarael disembarked their ship, Karath told the Arkanian that she was in trouble, and ordered his forces to search for Carrick and Hierogryph. When they could not find them, Karath began to ask Xamar to find the two fugitives, but he found that the Jedi was not there. Xamar stowed away on Carth Onasi‘s ship Deadweight when Carrick and Hierogryph used the ship to escape to Coruscant. Eventually, the Vanjervalis Chain’s tactical system was taken over by the Covenant co-founder and Sith acolyte Haazen during his insurrection against the Jedi Order. Haazen used a remote located on his Sith device, the Gauntlet of Kressh the Younger, to fire at the skybridge near the Draay Estate. This killed Master Xamar, who had turned against the Covenant, and many Jedi Knights attacking the estate. Karath asked Dallan Morvis, now the captain of the command ship Veltraa, why the Republic fleet was firing on the surface, and Morvis told the Admiral that someone sliced in their systems. A Republic officer told Karath that an incoming signal had bypassed their fail-safes, which prevented them from attempting to jam the signal or move out of range. Karath ordered all non-essential personnel off the Swiftsure while they tried to figure out a way to disable the security breach. When Lucien Draay and Zayne Carrick allied to stop Haazen, Draay managed to recover the remote and directed the fleet’s fire on the Draay Estate, killing Haazen and restoring control of the Vanjervalis Chain to the Swiftsure. Days later, Karath publicly announced that the Mandalorians were responsible for the bombardment and vowed he would take the fight to the Mandalorians. The Republic and the Jedi agreed to have the true events of Haazen’s insurrection covered up, and Carrick and his companions were cleared of any wrongdoing. Shortly after Haazen’s failed insurrection, the Jedi Knight Revan, along with fellow Jedi Knight Malak, formerly known as Alek, officially entered the Mandalorian Wars as a Republic mercy corps with the sanction of the Jedi Council. Under Malak‘s command, Karath and his forces retook the planet Omonoth from the Mandalorians long enough to recover the Arkanian Legacy’s remains. Karath captures Republic fugitive Dace Golliard. 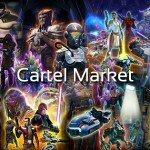 Eventually, the Defense Ministry received an anonymous tip—which was given by Zayne Carrick—about a full-scale Mandalorian raiding force set to arrive in the Ithor system. Karath led a Republic force consisting of the Swiftsure, the Veltraa, and the Testament to the Ithor system, and waited for the Mandalorians to exit hyperspace outside of an asteroid field. After the Mandalorians led by Cassus Fett exited hypserpace, the Republic forces prepared to engage them. However, the Mandalorian ships went around the fleet, and re-entered hyperspace. As Karath was expressing his surprise, the Swiftsure was hailed by Carrick. The former Jedi informed the Admiral that there were pirates in the asteroid field near the Swiftsure’s starboard flank. Before Karath could respond, Carrick told him that the pirates were being led by Dace Golliard, who fled the Battle of Foreost during the Great Sith War, resulting in Karath’s father’s death. Karath immediately spotted Golliard’s ship, the Gladiator. He instructed the Swiftsure’s crewmen to capture Golliard’s ship by crippling it with their lasers and bringing the Gladiator aboard the Swiftsure via tractor beam. However, Golliard escaped the Gladiator aboard an escape pod, and headed to a mining site in order to find a shuttle. Carrick activated the control panel aboard the Gladiator that activated the skyreaper drones—which were used by Golliard to capture slaves for the Crucible slavery organization—and the drones captured Golliard. After being brought aboard the Swiftsure, Karath taunted Golliard and had the former Republic officer taken into custody. After this, Carrick attempted to ask Karath to help him and Marn Hierogryph in reaching the planet Osadia. The Admiral gave the former Padawan credit for his nerve, even after all Carrick had put Karath through. Carrick interjected, citing the Repubic’s coverups for the events that Karath participated in over the past few months, which portrayed the Admiral as a hero. Carrick stated that some might say that those reports were not true, and finished by saying that he would never tell anybody the truth, although he implied that he would. After this conversation, Karath ordered Telettoh, the captain of the Testament, to take Carrick and Hierogryph where they needed to go. During the Mandalorian Wars, the Jedi Knight Revan eventually gained full control of the Republic fleet. Revan and Malak liberated Taris, fought Mandalore’s primary strategist Cassus Fett at Jaga’s Cluster, and defeated much of the Mandalorian forces at Althir. In 3,960 BBY, Revan forced a final confrontation with the Mandalorians over the Sith world Malachor V, and led the Republic to victory against them, defeating Mandalore the Ultimate. After the Mandalorian’s final defeat at Malachor V, Karath was not among the Republic forces who followed Revan and Malak into the Unknown Regions. The two Jedi claimed to hunting down surviving Mandalorians; however, Revan and Malak were searching for an ancient Rakatan space station called the Star Forge. 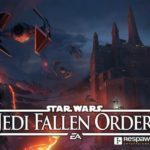 A year after their disappearance, Revan returned to the Republic as the Dark Lord of the Sith and, with Malak as his apprentice, declared war against the Jedi Order and the Republic, igniting the Jedi Civil War. Saul Karath is ordered by Darth Malak to destroy the planet Taris. In the year 3,958 BBY, Karath declared the Republic unworthy of his loyalty and defected to Darth Revan’s Sith Empire. He attempted, and failed, to convince his protégé and friend Carth Onasi to join him against the Republic. Karath’s first act of betrayal was to give the Sith codes which enabled the Sith to bypass a Republic Navy docking bay’s scanners. This allowed the Sith to sweep in and destroy over half of the docked ships before they had time to react. Karath brought the Interdictor-class cruiser Leviathan and several other ships with him into the Sith’s service. At some point after this, Revan promoted Karath as the commander of the entire Sith fleet. Not long after, Karath led the Sith fleet to Carth Onasi‘s homeworld of Telos IV. After the planet refused to surrender to the Sith, Darth Malak ordered Karath to destroy Telos, in order to test the Admiral’s loyalty to the Sith. Karath complied, destroying the planet’s surface and killing millions. During the Jedi Civil War, Karath intimidated hundreds of strategically important military worlds by threatening to destroy their cities by way of bombardment.Karath continued his service under Revan up until Malak seemingly killed Revan during the Jedi and Republic’s attempt to capture them both. Karath continued serrving the Sith Empire under Malak‘s command. In the year 3,956 BBY, the Sith fleet attacked the Endar Spire, which was the flagship of the Jedi Knight Bastila Shan, above the planet Taris. 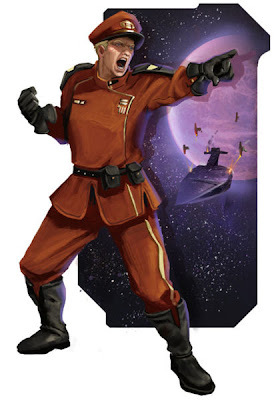 Shan was being pursued by Malak because of her power with Battle Meditation, a Force power that enabled her to strengthen the Republic forces’ resolve and coordinate their fighting effort while sapping the will of their enemies. Shan managed to escape to the Tarisian surface aboard an escape pod. After Malak’s forces captured Taris, Karath was in command of the blockade over the planet while the Sith forces searched the planet for Shan. Karath was eventually ordered by the Dark Lord to destroy Taris in order to prevent Shan’s escape. At first, Karath did not want murder the billions of people on Taris, including the Sith troops still on the surface. However, Malak reminded Karath what happened to his predecessor, and after Karath positioned the fleet, he began the bombardment. Shortly after Taris’ destruction, the bounty hunter Calo Nord—who was on Taris for business with the Exchange crime lord Davik Kang—was introduced by Karath to Darth Malak aboard the Leviathan, after Nord escaped the Sith bombardment. 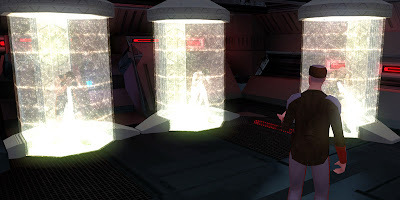 Malak was informed by Nord that Shan had successfully escaped Taris; although, Nord was unaware that it was Revan, Malak’s former Master, who assisted in Shan’s escape. Malak hired Nord to track down Shan and capture her alive. However, Nord was killed on the desert world Tatooine by Revan—who was now a retrained Jedi Padawan searching for the Star Forge. Karath received news of Nord’s failure and informed Malak, asking the Dark Lord to forgive him. Malak told Karath that while the penalty for failure was death, the failure was Nord’s, not Karath’s. When the Admiral asked Malak about hiring another bounty hunter, the Dark Lord replied that no bounty hunter could stand against a Jedi. 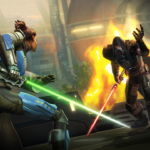 In order to not to repeat this error, Malak sent Darth Bandon, his Shadow Hand to capture Shan and kill Revan. However, Revan slew Malak’s Sith apprentice after the Jedi located a fourth Rakatan Star Map, which was necessary to determine the Star Forge’s location, on the Selkath homeworld Manaan. Sometime before Revan located that Star Map, Malak attacked the Jedi Enclave on Dantooine. The attack killed many Jedi and destroyed the Enclave. However, the local Jedi Council was able to escape. As Revan and the Ebon Hawk’s crew were en route to the Sith necropolis Korriban, which had a fifth Star Map, they were captured by the Leviathan. While the Ebon Hawk was being brought in via tractor beam, Revan and his companions were discussing a means of escape, and Revan chose a member of his party to escape the Sith and save them from capture. 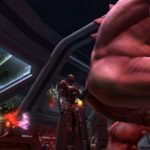 Revan, Shan, and Onasi were put into force cages, and were questioned by Karath. After Onasi swore he would kill Karath for the deaths on Telos, the Admiral said that Darth Malak was far more interested in Shan and Revan. When Revan swore he would not betray the Jedi, Karath found that Revan did not know of his former identity. The Admiral suspected that he would not succeed in the interrogation, stating that Malak would torture them for information and for his own twisted pleasure. However, Karath knew that at the time Malak was in another sector, and that it would a while before Malak arrived at the detention area. Karath began interrogating the Jedi and Onasi through means of torture. Karath tortures Revan, Shan, and Onasi. Knowing that Revan cared for Shan, Karath made her suffer each time Revan refused to answer his questions. Karath used this to test Revan’s loyalty when he asked the Jedi where the Jedi Enclave was, but Revan still gave no answer to the Admiral. Karath revealed that the question was only a test, for Malak, having been trained at the Enclave, knew its location and had already destroyed the Enclave. Karath left the three alone until Malak would arrive. Both Shan and Revan felt a disturbance in the Force, and they knew that Karath had sent a message to the Dark Lord regarding their current location. Meanwhile, the Ebon Hawk crew member that Revan had chosen to free the rest of the crew managed to deactivate their force cages. Feeling Malak’s presence approaching, the Jedi devised a plan to escape, which involved going to the bridge and disabling the tractor beam. Revan sent the Mandalorian Canderous Ordo and the rest of the Ebon Hawk’s crew to the docking bay so that they could deal with the guards. Revan, Shan, and Onasi fought their way to the bridge and confronted Karath, who was guarded by two Dark Jedi and a group of Sith troopers. Karath offered to ask Darth Malak, who was on his way to the bridge, to be merciful when he arrived if the two Jedi and Onasi would surrender their weapons. After Onasi refused, Karath went on the attack, remarking that Onasi always liked doing things the hard way. Revan, Shan, and Onasi slew the Sith troopers and Dark Jedi bodyguards, and struck Karath down, leaving him mortally wounded. Before he died, Karath asked Onasi to come closer so that he could speak with him. In a whisper, Karath told Onasi about Revan’s former identity of Darth Revan. Karath taunted Onasi, telling him to remember the Admiral’s words whenever his former protégé looked at those he thought were his friends. Karath then succumbed to his wounds. 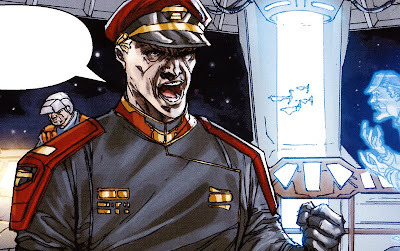 After Karath’s death, the Sith Admiral Varko was promoted to Karath’s former position as the Sith fleet’s commander. Malak planned to conquer the Core worlds in order to crush the Republic permanently. However, Revan and his companions managed to locate the Star Forge, and the Republic fleet engaged the Sith forces around the Star Forge above the surface of Rakata Prime as Revan boarded the space station. Revan managed to redeem Bastila Shan, who became Malak‘s Sith apprentice after being captured aboard the Leviathan, and killed Malak in a lightsaber duel. 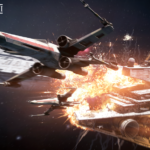 The Sith forces were routed after the Republic destroyed the Star Forge. At the end of the Dark Wars five years later, before the Sith Lord Darth Traya succumbed to the wounds dealt to her by the human female known as the Jedi Exile, Traya predicted that the planet of Telos would eventually be restored through the efforts of the Ithorians led by Force adept Chodo Habat, who led the Telos Restoration Project. Traya also predicted that Telos would forget the devastation brought by Saul Karath when he bombarded the planet. Karath lies fatally wounded on the Leviathan‘s bridge. 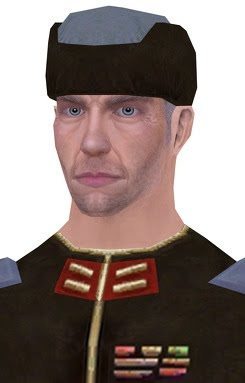 When the Human male known as Saul Karath lost his father, Craddock Karath, at the Battle of Foerost during the Great Sith War, he enlisted in the Republic Navy. After starting his military career, Karath tried every duty on a flagship at least once. He eventually grew to be a skilled pilot and capable tactician. Karath was known for acting on quick judgments, which were sometimes viewed as reckless. His bureaucratic abilities were not as developed, which led to a number of setbacks in his career. However, Karath was known for his ability to survive and thrive, and considered the Navy his family. Karath never told anybody that his father’s death had caused him to join the Republic Navy. Because a former Jedi and the Mandalorians were involved in his father’s death, Karath did not trust members of either group. When the fugitive Padawan Zayne Carrick attempted to warn him of Serroco’s coming destruction, Karath wrongly assumed he was a Mandalorian spy. During the Mandalorian Wars, other Jedi were prone to similar receptions from Karath. Karath was a man who respected firepower. He trained many of the soldiers and officers in the Republic fleet, including Carth Onasi. Onasi and Karath shared similar backgrounds and a habit for making quick, if not reckless, judgments. Onasi’s career path was also similar to Karath’s, explaining why the Admiral took an interest in the pilot. Karath would not usually set up military defenses that would potentially endanger civilians, such as the defenses on Serroco shortly before its destruction. A year after Revan and Malak came back from the Unknown Regions as Sith and attacked the Republic, the Republic Navy was devastated, and Karath was faced with the loss of his troops and command. In an attempt to save both, Karath declared the Republic unworthy of his allegiance, and brought his flagship Leviathan and a large amount of troops to Revan’s service. Because he was the first officer of an important rank to join the Sith, other Republic officers followed his example and betrayed the Republic, not wanting to fight against a foe who knew all their tactics and strategies. After Malak betrayed Revan and assumed his mantle of Dark Lord, Karath thought that Revan’s apparent death would make his command easier. 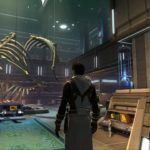 However, Karath discovered that serving Malak was not as easy as he had hoped, but Karath would not abandon his position as the highest-ranking officer in Malak’s navy. To Karath, keeping his forces intact overruled all other concerns. When Malak ordered Taris’ destruction in an attempt to kill Bastila Shan, Karath tried to intervene for the billions of innocent people and the Sith troops on the surface. However, Malak threatened him, and Karath obeyed the Dark Lord’s orders. When Karath tortured Revan, Shan, and Onasi after capturing Revan’s ship Ebon Hawk, Karath attempted to justify the bombing of Telos IV to Onasi, stating that in war even the innocent had to die. Aside from Basic, Karath could speak and comprehend a variety of languages, including Durese, Khilese, Sullustese, Mando’a, Bothese, Zabraki and Kuat. Karath owned a prototype energy shield of Verpine design, using it for extra protection during battle. During his time serving the Sith, Karath used a Sith Assassin blaster pistol. He also owned a code cylinder and an encrypted comlink. Karath wore a Republic officer’s uniform during his service to them. 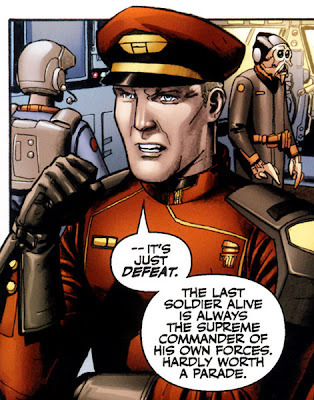 After joining the Sith Empire, Karath wore a Sith officer’s uniform. 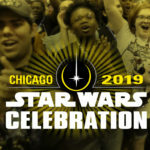 This article uses material from the “Saul Karath” article on the Star Wars wiki at Wikia and is licensed under the Creative Commons Attribution-Share Alike License.